In the framework of OW2 OSCi initiative, Orange Labs Issy-les-Moulineaux hosted the OpenCloudware Conference, on November 12 afternoon. The workshop was proposed and coordinated by OW2 with the aim to explore cooperation opportunities between projects. 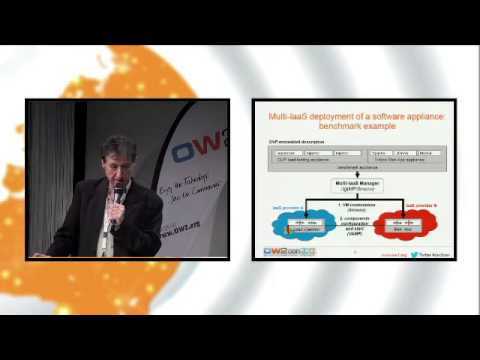 This second edition of the OSCi Convention gathered the OpenCloudware and OCEAN projects. External participants from CompatibleOne, ModaClouds, France Grilles, Cedexis, Nu@ge, OSSMeter and other cloud projects were also present. The main way to "go cloud" has proved to be, for security and economic reasons, hybrid : mixing private with public. Moving to Cloud PaaS is then requires to: manage the lifecycle of applications over different cloud providers; mask the heterogeneity; automate the deployment whatever the application technology and execution environment are, etc. This is what tackles OpenCloudware, which aims at enabling flexible multi-cloud applications thanks to a full automated think-build-run chain.